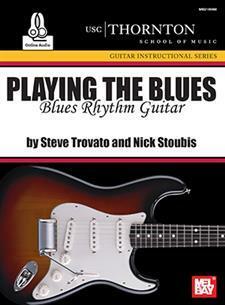 This in-depth blues rhythm guitar text is core curriculum of the University of Southern California's Studio Guitar Department, which is part of the prestigious Flora L. Thornton School of Music, located in Los Angeles, California. It features eighteen twelve-bar blues rhythm guitar accompaniments in the style of guitarists such as Chuck Berry, Eric Clapton, Jimmy Page and Stevie Ray Vaughan. Nine of the songs use a shuffle feel and nine use a straight eighth note feel. The play along audio contains two versions of each of the eighteen songs in the book. The first version has the guitar part and the second version is without the guitar. This gives you the ability to play along with the guitar part as a guide and also to play along with the track as the only guitarist. The examples are written using traditional musical notation and tablature. Included for each song is a short description of the important points to consider when learning each example. The book presents songs that will expand the guitarist's vocabulary by presenting a variety of different ways a guitarist can play through the twelve bar blues. A number of different chord variations, keys and tempos are used in demonstrating these eighteen idiomatic rhythm guitar parts that have been used by the masters. Includes access to online audio.